This is Blitzen's Cousin. He visited our greenbelt on Saturday evening. It was a pleasure to have such a gentle, friendly giant visit us. Nonplused by us, he feasted on what the outside of our fence has to offer. Our apples, chokecherries, and alfalfa. I see you, seeing me through the tree. Aspen twigs strewn about on the ground. isn't even a year old. I found this on my Aspen trees. And these... Hoof tracks... Oh, Mr. Elk, I have been trained by the best eye. While out watering my annual pots I noticed my weeping spruce. that. I chalked it up to never really knowing. Well, look at what other gardening chore he helped me with (my words filled with controlled, seething anger)... He dead-headed the roses, ALONG with the new buds! Most people that know me, know I was raised by a hunter. I grew up part of my life in the mountains and the eastern plains of Colorado. Learning to respect wildlife and natural world the Lord blessed to us, our keeping. Learning the signs of these animals. Learning how to stalk these animals. Times that I would never trade for anything in this world. I relished going with my dad. They also know I could never kill one of these animals. The other thing people that know me, know about me, is my passion for my yard. My yard is my third child. I spend at least 6-8 hours in my yard this time of year and twice that during a project in the spring or the fall. It isn't just a hobby to me, a lifestyle, or the way I make my money. It is literally in my blood. My grandparents on my father's side were gardeners and farmers. My grandparents and great-grandparents on my mother's side were avid gardeners and my great-grandmother was a famous gardener in her own right-a flower judge and has a park named after her. Since living here, I have dealt with evicting skunks living under our front porch, raccoons and skunks digging holes my garden. I have handled these things in stride as they are out of my control. This Elk, I am stumped. We have been here 8 years and have not had a creature such as this visit us. Must have followed the creek down. We back to a creek/open space greenbelt. All I can do is try to rectify the damage. I know him scraping the Aspen is a sort of death sentence for this tree. While they withstand this type of damage/activity in the mountains, at this elevation they have so many health issues. This will surely open it up to canker. 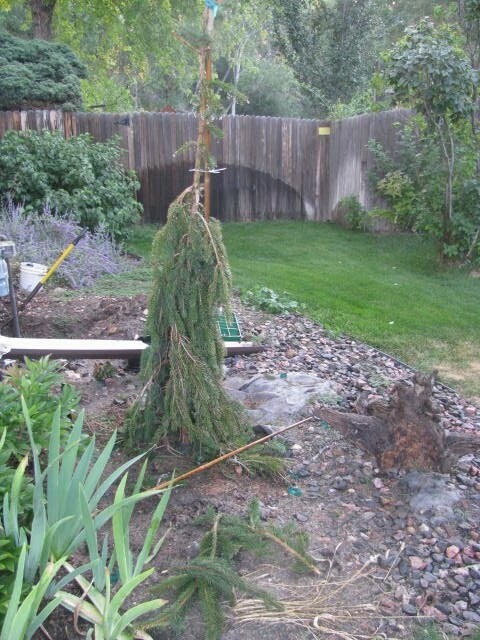 I am going to try to save my weeping spruce. 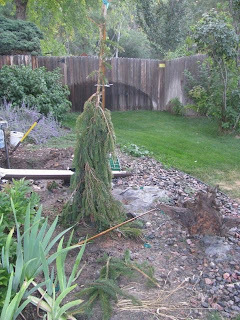 It should be a 20 foot weeping tree in time, if I lose the leader out of it, it will only be a four foot tall weeping spruce and very fat. Doesn't work for the space I have it in at that point. Well, Mr. Elk, I hope you enjoyed your visited to my garden that had so many comforts of home and delicacies to be enjoyed. Please move on now. We enjoyed your visited, briefly. So now I pray that he does not return-oh, he can return, as long as he stays in the back! 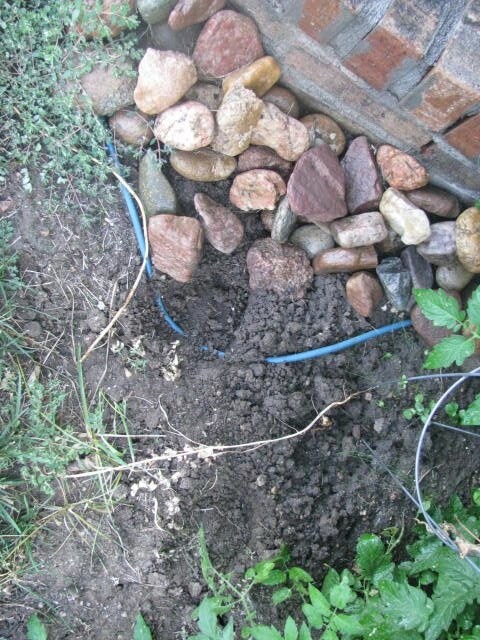 Deer are magnificent creatures, but I am so glad I don't have to deal with them here and their destruction of gardens. Oh Heather, I can just imagine how you are feeling. You have worked so hard to create your little garden. You have so much knowledge about plants and nurturing them. You take a lot of time to decide just which plant will go where and isn't it just your dumb luck that an elk invades your yard in the middle of the city! 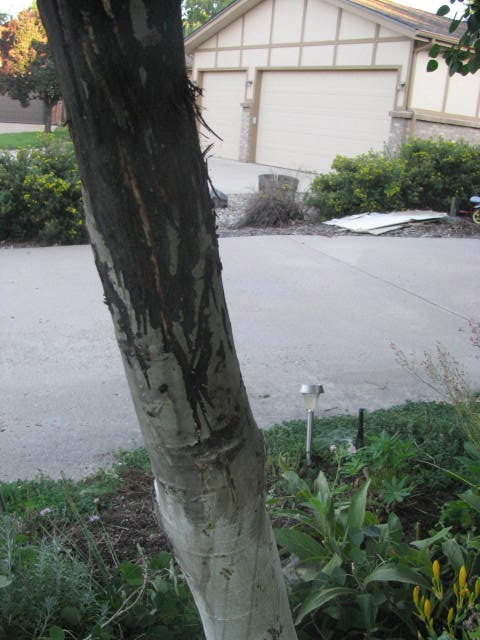 The other plants will recover, but your beautiful trees will never recover. Yikes..They are fun to see only when they are in the right place like the forest. I hope he moves on, because you put to much time and work into your lovely garden just to have it snacked on by an Elk. EEEEK!